Striving to break the mould, we are not your average detailing shop. We specialize in offering a premium service to discerning vehicle owners that is different from what you'd expect. Exceptional results and true attention to detail form the core of our company. When your vehicle has to look its best, look no further than Stellar Finish Auto Detailing. We are Vancouver Island's only Gtechniq Accredited Detailer. We are certified to offer all levels of Gtechniq surface protection products , including their unbeatable ceramic coatings like Crystal Serum Ultra 9 year guaranteed coating. We are a full service home based detail shop centrally located in Victoria BC. We invest in quality products that make your vehicle look amazing; not flashy gimmicks or swag. We specialize in ceramic coatings , paint correction (machine polishing) and vehicle surface protection. We offer interior and full exterior services for any make and model, and also have the expertise to detail motorcycles. * some services may not be available. We cater to drivers who take pride in having a clean, well maintained vehicle. We are not a volume based detail shop. We do above average work, and this requires more time to be spent on the vehicle to attain these results. We only use the highest quality products available and utilize the most advance techniques to make your ride look amazing. If you're looking for a quick in-and-out dollar detail, or have an emergency such as a large spill or cleanup, we might not be a good match. But if you want nothing but the best quality and attention to detail, you've come to the right place. 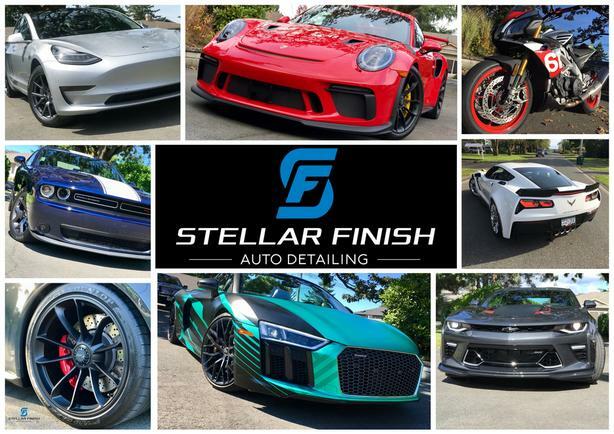 www.stellarfinishautodetailing.com for complete information about all our services and more. Check us out on FB and Instagram too!